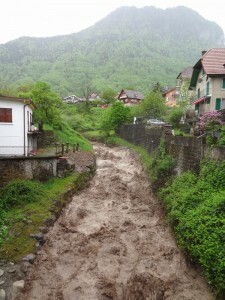 Bad weather caused damages and evacuations in Western Switzerland in early May due to floods, debris flow and landlsides. 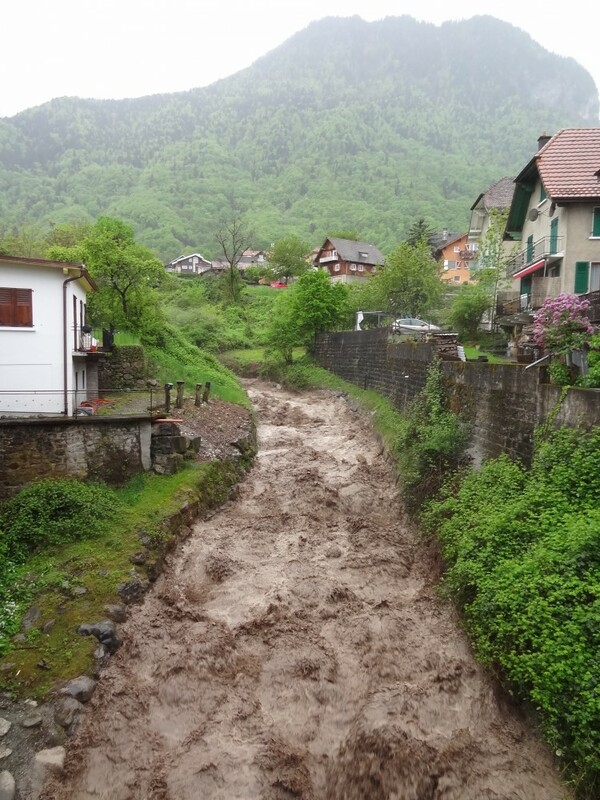 Strong precipitations occurred on Western Switzerland in the beginning of May 2015, especially on May 1st. 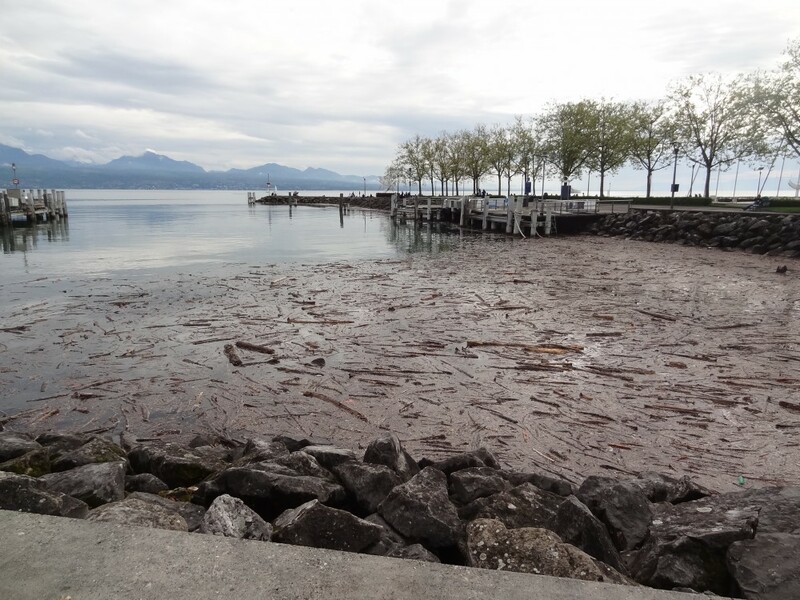 Over 100 mm of rain fell in about 24 hours in some places in Western Switzerland, with a maximum of 130 mm at La Dôle, Canton of Vaud. Those heavy rains caused different damages as debris flow, floods and landslides. 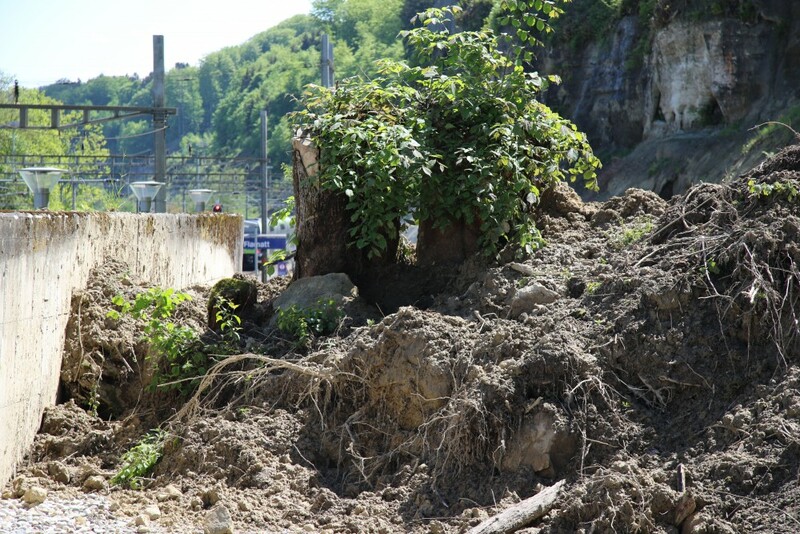 Several roads and railway have been closed, preventively or due to tracks obstructions in the Alps, the Jura mountains and in the Swiss Plateau. Two landslides have disrupted two main railway tracks, causing high traffic disturbances due to deviations and affecting the railway traffic during more than one week. 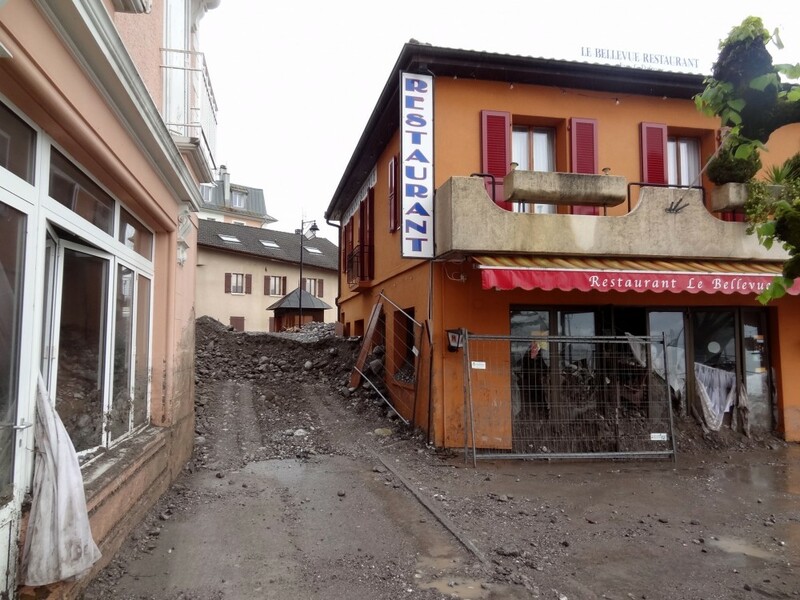 In the village of St-Gingolph in the Canton of Valais, the Morge river -which is the border between Switzerland and France along the lake Léman- overflowed two restaurants with debris flows. 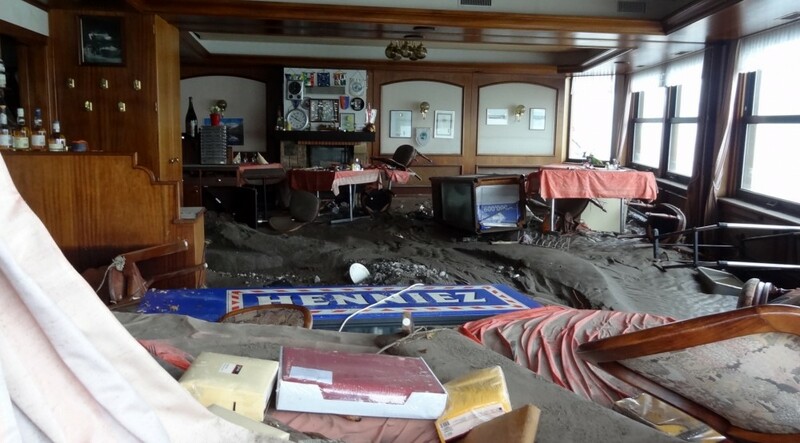 Their groundfloor levels have been totally destroyed. 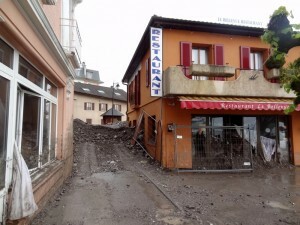 In the town of Monthey, Canton of Valais, about 300 residents along the Viège river have been evacuated during the night because of the high risk of floods. 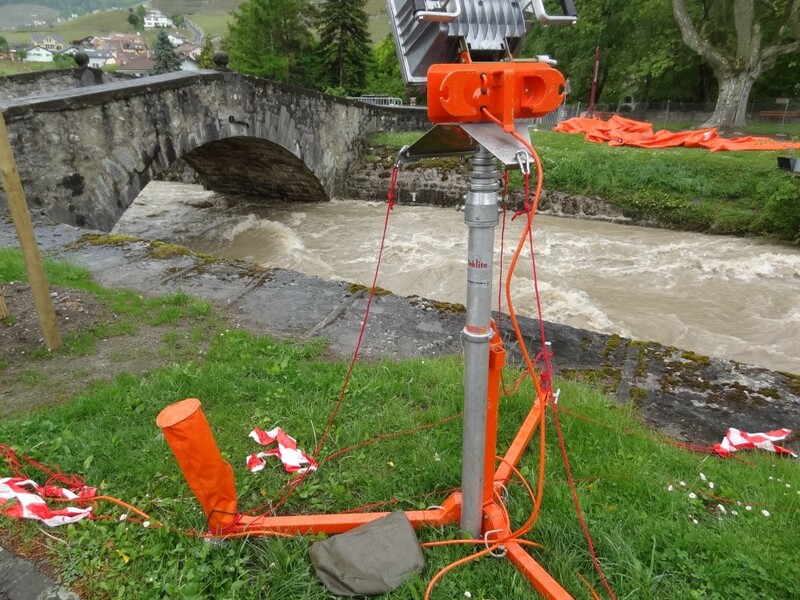 The Arve river -which flows through the Chamonix Valley in the French Alps- has reached a flow rate record with 903 m3/s compared to its standard flow of 77 m3/s at its mouth into the Rhône river in Geneva on 2nd May. Several bridges in the town had to be closed, affecting the urban traffic of the second biggest town of Switzerland. 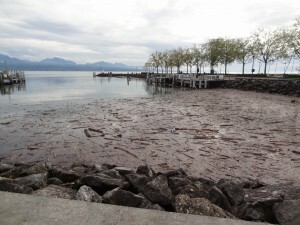 North-east of the Western Switzerland, the lakes of Neuchâtel (Canton of Neuchâtel), Biel (Canton of Bern) and Morat (Canton of Fribourg), overflowed because of the high flow rate of the Aare river. The maximum height of water level has been reached about 8 days after the first heavy rain with a water level increase of 1 meter. A lot of wood has been carried by the rivers to the shores of the lakes. The damages are only material, no injuries were identified. Financial and temporal damages consequences are high for the two destroyed restaurants. The return to normality for river flows and water levels of the lakes took several weeks. Rockfall inventory and distribution in space and time with Dr. M. Böhme (former PhD student of M. Jaboyedoff at NTNU, Trondheim). Several subjects were discussed such as strategy for drone and photogrammetry, Flow-R application etc. The group-Risk ISTE (M. Jaboyedoff) is participating to the project ParaChute dedicated to rockfall hazard mapping along a railway line in western Québec. This project is led by Prof. J. Locat and Dr C. Cloutier from the LERN at University LAVAL. M. Jaboyedoff participated to the second workshop of the project which held at ULAVAL in Quebec City in order to plan the summer field works. The private company in charge of the railway line exploitation was participating a well as Several governmental agencies. 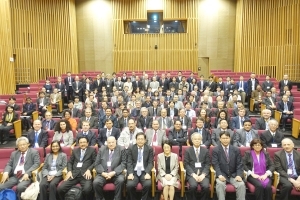 M. Jaboyedoff participated to the “Second Global Summit of Research Institutes for Disaster Risk Reduction: Development of a Research Road Map for the Next Decade” which was held at Uji Campus of Kyoto University on 19-20 March 2015. The goal of this meeting was to discuss the different challenges linked to disaster risk reduction (DRR) and resilience to disasters. M. Jaboyedoff presented how the Risk-Group of the ISTE deals with those challenges. This meeting permitted to draft a Resolution that in process of finalization approved by 83 research organizations (51 non-Japanese) coming from 21 countries. In addition, University of Kyoto proposed to create the Global Alliance of Disaster Research Institutes (GADRI). Secretariat of GADRI will be located at DPRI at University of Kyoto, Prof. Hirokazu Tatano acting as Secretary General. The Dean of the Faculty of Geosciences and Environment, Prof. F. Bussy, has approved the participation of the faculty to GADRI. 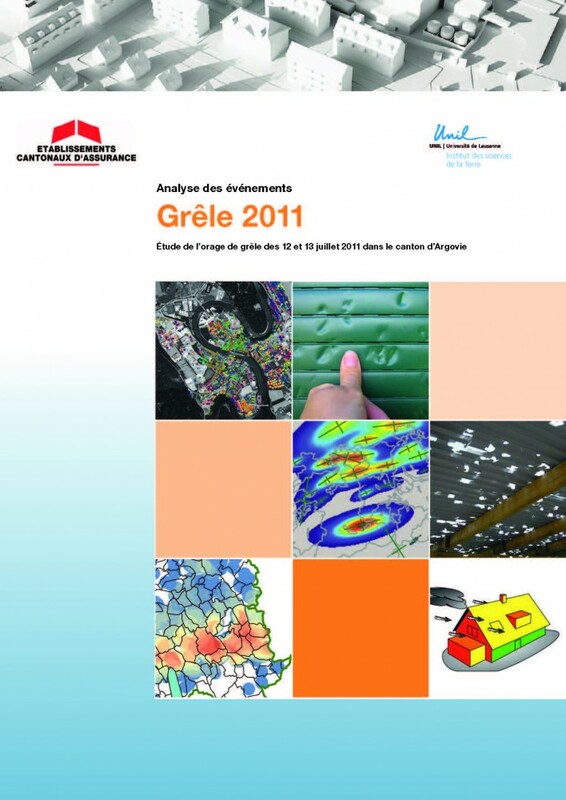 The swiss Intercantonal Reinsurance (VKF/UIR) published a report on a hail event which occurred in Northern Switzerland in 2011. This report has been written in collaboration with our group. The study focuses on the Canton of Aargau, which was particularly affected by the event, and takes advantage of insurance data and hail intensity derived from meteorological radars. 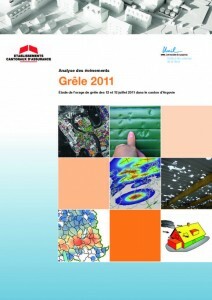 The document is available online in french or in german. I’m Simone, a master student in natural hazards from KU Eichstaett, Germany. 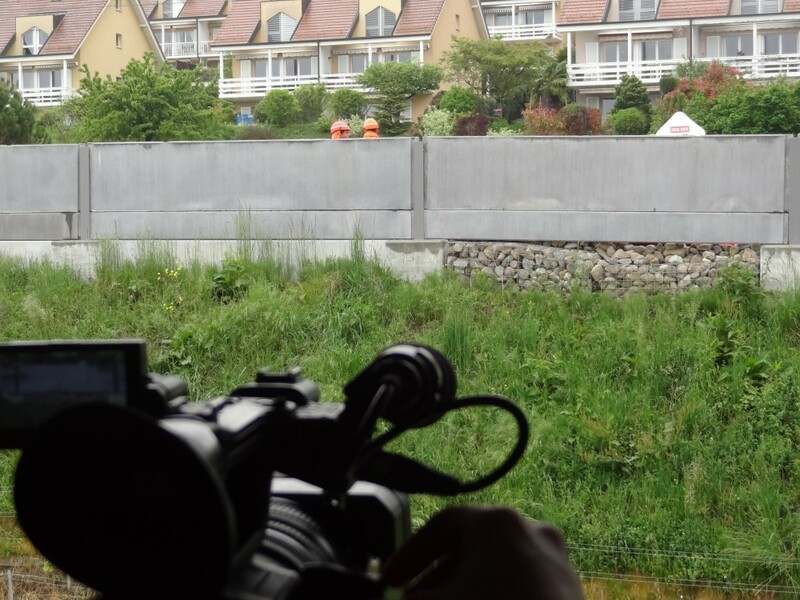 I had the opportunity to join the Risk Analysis Group of UNIL for three months, to work on the project for my MsC thesis, concerning the acquisition and threatment of 3D point clouds. After having been warmly welcomed here, I’m looking forward to a productive and diverting time with the Risk Analysis Group in Lausanne. Ryan Kromer is visiting the group from Queen’s University in Canada. He is a masters student working on monitoring rockslopes along Canada`s vast rail network. Ryan is collaborating with our group in order to develop a new methodology to detect sub-mm rock deformations using terrestrial LiDAR. 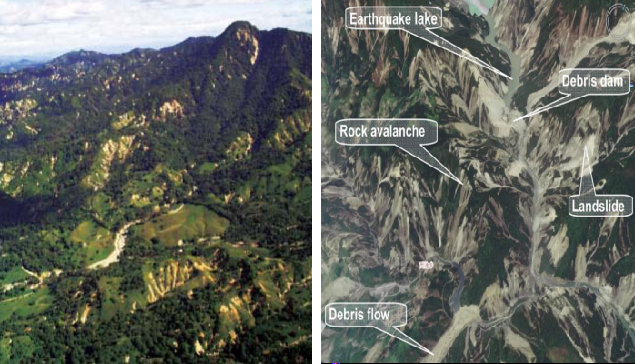 The goal of this stay is to implement this method to better understand the precursor phase of rock slope failure and to move towards a rock fall early warning system. Roxana is a visiting PhD Candidate from the Department of Geography and Regional Research, University of Vienna, Austria and a Marie Curie Fellow working in CHANGES Project (Changing Hydro-meteorological Risks as Analyzed by a New Generation of European Scientists) during January 2011 – December 2014. Her PhD Thesis investigates the quantification of uncertainties in vulnerability assessment of infrastructure and buildings to hydro-meteorological hazards. This research stay (March – October 2015) is supported by the Federal Ministry of Science and Research (BNWF), Austria. A joint IUCN – UNEP – University of Lausanne workshop in Kathmandu and Pokhara, Nepal on the topic of Ecosystem-based disaster risk reduction was held April 21-25, 2015. The main objective on the workshop was to engage with policy makers about the importance of disaster prevention with a focus on “Eco-safe roads” in Nepal. Policy makers were invited to visit the three EPIC roadside bio-engineering sites in the Pokhara / Panchase area district. The last site visit in Bhat Khola village, Syangja District concluded five minutes before the 7.8 magnitude earthquake struck. 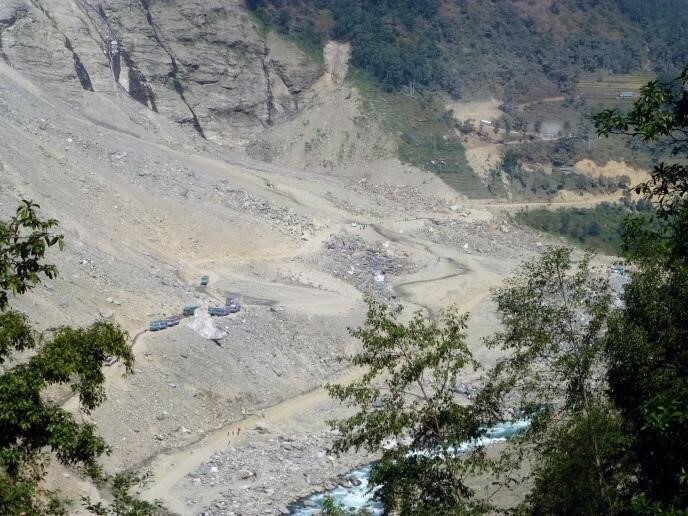 Fortunately none of the residents of Bhat Khola were injured nor were any of the workshop participants. Many others were less fortunate and our thoughts are with the victims and affected people of Nepal. We can only hope that this tragedy leads to lessons learned and concrete actions for improved post-disaster management and a more prevention-oriented disaster management approach in Nepal.